Born and raised in southeastern Minnesota, Elizabeth will be the first to point out that her home state has more than 10,000 lakes (there are actually 11,800, but who’s counting?). Elizabeth started her career as a community organizer before joining the Office of St. Paul Mayor Chris Coleman. Eager to tackle public policy in our nation’s capital, Elizabeth moved to Washington D.C. in 2009 to serve as a legislative assistant to U.S. Senator Amy Klobuchar. In this role, Elizabeth cultivated her passion for education policy and improving opportunities for all kids and families. Most recently, Elizabeth was the associate director of early childhood policy at Save the Children Action Network, where she helped launch a new domestic education campaign that focuses on investing in children from birth to age five. As Vice President of Strategy and Operations to the president of 50CAN, Elizabeth manages internal collaboration across national and state teams and supports our state campaigns. Elizabeth earned her bachelor’s degree from St. Olaf College and holds a master’s degree in public management from Johns Hopkins University. Eleanor Roosevelt was a reformer in every sense of the word. Intelligent, courageous and strong in spirit, her activism transformed the Office of the First Lady and advanced issues affecting women, children and people of color. Her tenacity and passion for improving people’s lives is a shining example of the kind of leader who pushes boundaries to create meaningful change. I believe that high-quality education is the key to expanding opportunities and creating a path of upward mobility for all children. That’s why my job feels less like work and more like my vocation. Every day, I help guide and support the efforts of our 50CAN team as we strive to give more kids a chance to succeed in school and in life. As the granddaughter, daughter and sister to teachers, I come from a long line of public educators. I was fortunate to grow up in a public school system that provided a network of support to my family and a community in which my brothers and I could thrive. Every child deserves that same opportunity. Spontaneity. I’m one to analyze a situation before jumping right in. 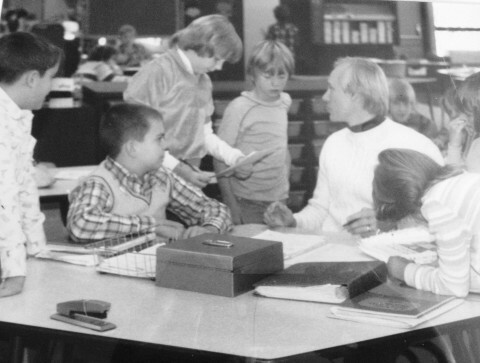 My father was a public school teacher, and in the years after he passed away, I can remember dozens of former students reaching out to my family to share personal stories of how he impacted their lives. His legacy taught me that great teachers and schools have the power to influence our decisions and shape our future–and that’s a cause worth fighting for.